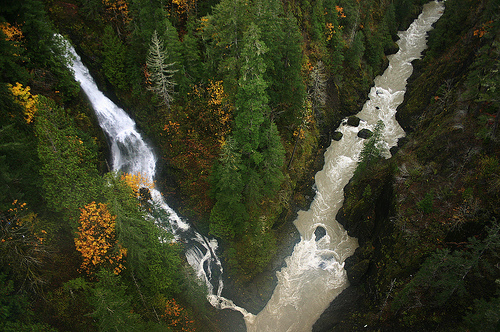 It is tough to say whether the falls on Vincent Creek, or “The High Steel Bridge” that spans the narrow, deep canyon of the South Fork of the Skokomish River is the real attraction here. The elevation from bridge deck to the stream below is reportedly 420 feet. Locals simply say High Steel Bridge, which incidentally has a falls nearby on Vincent Creek to the west as you cross the bridge. 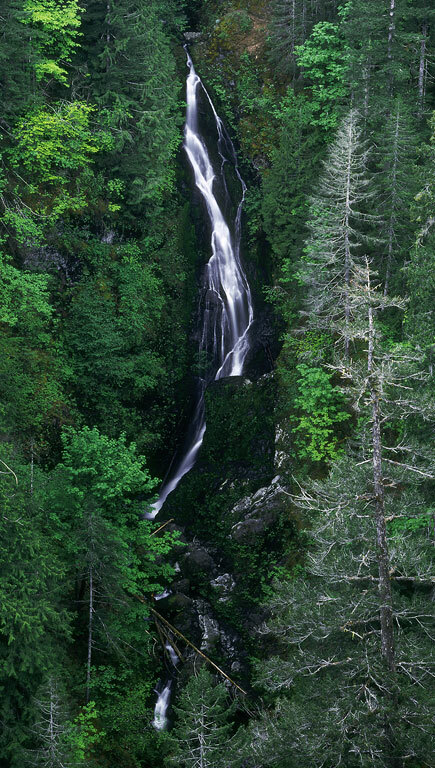 This narrow falls with a drop of about 125 feet is best viewed in winter and early spring when the small watershed above has sufficient runoff to deliver to the falls. It may be running sparsely, or near dry, by early summer into the early fall before rains restore the flow. NOTES: The bridge was originally built as a logging railroad bridge, and is still in use for car and truck travel. Vertigo is a word that comes to mind while standing mid-span and looking over the side to the rock-filled, narrow gorge with rushing water far below on the east side, or to the falls themselves on the west of the bridge. Photographing this falls is benefited by use of a telephoto lens of focal length 100-200mm. Occasionally an adventure seeking (read as crazy) kayaker may try to run this stretch of the South Fork of the Skokomish.